It can certainly be argued that White Wolf are one of Canada's most underrated melodic metal bands. 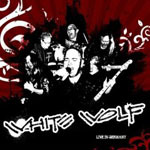 If you look back to the eighties and think of bands that never made it to the top but perhaps should have, many will argue that White Wolf are one of those bands. 1984's 'Standing Alone' and '86s 'Endangered Species' remain obscure cult metal classics. After splitting up in the late eighties they returned with 2007's acclaimed 'Victim Of A Spotlight' while Escape Music reissued the aforementioned two albums with bonus tracks and videos. As singer Don Wolf says after the third song (before his mic was cut-out) the band's visit to Europe last year was their first trip so 'Live In Germany' is a very special release for them and their fans. The sound is excellent and the band are on fire performing with vigour through all 11 tracks. The set was recorded at Germany's United Forces Of Rock on September 30th, 2007. Standout tracks include 'What The War Will Bring' and 'Shadows In The Night.' A killer!